I picked up this book from the library a few days back, mainly due to the fact that I want to read something other than my usual picks. It was such a riveting read, that I managed to finish it in the last 3 days. Malala’s story is that of courage, grit, belief and perseverance amidst the hard realities and uncertainties of her life in Pakistan. Her fight for her education as well as that of other girls in her country is inspirational and at the same time, thought provoking. It also helped me feel grateful and blessed that I was able to get a good education and feel a little more empowered to voice my opinions. The initial few chapters talk about her parents’ life and her early childhood in Swat valley. The way she describes the simple life and beauty of the valley and mountains is captivating. The book also details out the political turmoil and the history of Pakistan since the separation. It felt heart-warming to read about the support from her family, especially her father. Their conversations show how encouraging her father had been in her growing-up years. Without any financial or political backing, taking a stance on something you believe in and being courageous enough to spread the message is something truly extraordinary. “Courage isn’t internal which you find deep inside. Rather, courage is external when you trust that there are others who will support you and hold your back”. True to these words, Malala’s courage stems from the fact that she has a father who believed in her, pushed her and didn’t force her to accept the status-quo. 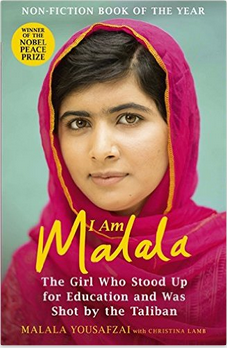 Malala’s autobiography is an inspirational read for everyone. Do check it out if you get a chance.